A stall is in place at the trade fair exhibition site, where Film news anandhan has taken a stall and exibhited the photos in the stall. It is an opportunity for everyone to take a look at the stall in the trade fair. Film News Anandhan is one of few people in the wold who has this extreme passion towards the film industry, he has almost spent his entire life for the film industry. Film News anandhans efforts cannot be replaced by anyone. His dream is to open a site for posting and uploading all the information to this site. Sponsors are very much welcomed to make his dream in to reality. Film News Anandhan Celebrates his birthday on January 1st. Film News anandhan is releasing a book on Songs lyrics shortly. He is one of best film personlities i can who does anything and everything for film he is none other than The great Film news anandhan. He so very passionate to the film industry that he still works 20 hours a day at the age of 82 and still realises books every year and is tireless worker. Film news anandhan realised a book on film industry that has all the information and photographs of the film industry from the time the film industry started in Tamil and to till date and the front cover is shown in the picture. But all signs were there at a very young age, when Anandan took up hobbies in photography and writing, producing and directing dramas. Anandan's love for the arts eventually became his greatest passion in life as he embarked into a new journey in the film industry in 1954 as an assistant to C.J.Mohan (who served as N.S. Krishnan's cameraman at the time). Soon afterward, Anandan found himself serving as a photo-journalist for his friend, Devarajan's publication, Film News. The name Film News not only became a catch phrase to his name, but also created a respect and adoration for him and his work as years passed by. Film News Anandan entered a new phase in his career and his life, when he began his own news service titled Film News in 1958. Even today, the Film News office on Peters Road, Chennai continues to be the one-stop center for all types of tamil cinema news that one could possibly think of. Besides Film News, Anandan's bigger achievement came through his establishment of the Public Relations Officer post in Tamil Cinema. Yes, indeed, Film News Anandan was the first to create the post and serve as the very first P.R.O in tamil cinema for Nadodi Mannan which was produced and directed by M.G.Ramachandran himself. His greatest ambition was to showcase all of his cine collections and memorabilia as a way to educate and arouse the interest of the public. Anandan accomplished organizing and presenting his first exhibition on the occasion of the Golden Jubilee of the Film Industry in 1981. He conducted a cinema exhibition as a part of the Tourist Fair on three separate occasions for which he won the Best Stall Award three consecutive years. Anandan also has the distinct honor of conducting exhibitions on Telegu and Malayalam films at the International Film Festivals in Hydrabad and Trivandrum in 1986 and 1988 respectively. More recently, Anandan was invited to conduct an exhibition celebrating the 50 years of A.V.M. Productions. For such a man who has tirelessly worked to preserve both the past and present of tamil cinema, the awards and accolades have come aplenty. As early as 1986, Film News Anandan received the distinguised Y. Venkanna Clowdary's Kala Peedam award for his tremendous contribution to Human Progress as a Film Historian. In 1991, the Tamil Nadu State Government bestowed him with their highest honor in the title of Kalaimaamani. Similarly, in 1989, Anandan was honored as a veteran during the Golden Jubilee of the Film Chamber. S. Krishnaswamy had once written in The Illustrated Weekly in 1965 on Anandhan's work, stating "The collection is something wonderful. As you look through Anandan's albums, you travel through the years and recollect the faces of stars who have been lost in the shadows, and you feel as though an unbroken thread is connecting all these motion picture efforts together." All of us are glad that Film News Anandan's "unbroken thread" has connected with the Valai (The Web), where he begins a new journey in sharing his thoughts of the past and his insights into the future of Tamil Cinema. No amount of writing on my part can begin to cover the knowledge, patience and passion that Film News Anandan has invested in his work. It is indeed Anandan's words themselves that can make all the difference. Film news anandhan is seen in the picture. Film news anandhans photo collections are numerous and splendid. Tamil Cinema History - The Early Days. Compiled by "Kalaimaamani" Film News Anandan. During the past 82 years, Tamil Cinema has reached many a mile stone. In this article, 'Kalaimaamani' Sri. Film News Anandan, noted film historian and researcher, considered an walking encyclopedia on Tamil Cinema traces the growth of Tamil Cinema from the silent era to the birth of the talkies and beyond. This is the first part of this ongoing series on the evolution of tamil cinema. The year marked the birth of the Silent Film in Tamil Nadu, the precursor to the modern day Tamil Cinema, as we know it. R.Nataraja Mudaliar (featured on the right) was the first producer, director and cinematographer in Tamil Cinema. Trained in London, he came back and made Keechaka Vadham in 1917, the first Silent feature film in Tamil. 1917-1930 Other Silent movies followed. Encouraged by the success of the medium, Prakash Raghupathy (on the left) made Bishma Pratigna. Other mythologicals and historicals followed - Sarangadhara, Bhoja Raja, Gajendra Moksham etc. Censor Boards were established in Madras in 1918. It was inevitable! In 1931, the talkies came to Tamil Nadu. The first Talkie with Tamil in it was Kalidas (on the right). It was directed by H.M.Reddy and produced by Ardeshar Irani's Imperial Movie Tone and released on 31st October. Kalidas was produced in a hurry, and was technically flawed. It was not a pure Tamil talkie, in the sense that the artistes spoke (mainly) both in Tamil and Telugu. It starred T.P.Rajalaxmi (on the left) as its heroine. She was a stage artiste who gained immense popularity as a movie actress and went on to make movies herself. Though it was a puranic story - both Thyagaraja Kirtanas and the Indian National Congress publicity songs had a place in the picture. Its curiosity factor, if anything guaranteed its success at the box-office. Kalava (Rishi) was the first cent-percent talkie in Tamil. It was directed by P.P.Rangachari. In a couple of years, many more producers and entreprueners entered moviemaking, encouraged by the success of the first few talkes. Competition heated up in the film industry; so much so that in the same year, the same stories (Prahaladha, Srivalli were being made by different people. Prabhath Film Company made the Seetha Kalyanam around this time. The famous Veena Vidwan Balachander's (on the left) brothers and sister acted in this movie. It starred S.Rajam as Lord Rama and Jayalakshmi (his sister) as Seetha. This year marked the creation of a Box-Office Super star in M.K.Thyagaraja Bhagavathar. (on the right) The movie Pavalakkodi which introduced the lead pair M. K. Thyagaraja Bhagavatar and S. D. Subulakshmi. it was a box office success, made on a seemingly large scale. As electrical arc lights were not available then, grand sets were erected in the exterior of the studio and pictures shot with the help of sunlight. Until 1934, Tamil movies were mostly made in Bombay and Calcutta. Srinivasa Kalyanam changed this practice, being the first tamil picture produced in Tamilnadu. It was produced by Srinivasa Cine Tone. Lava Kusa marked the beginning of the famous Tamilnadu talkies. It was produced by S.Soundararaja Iyengar. TamilNadu talkies went on to make many such box-office successes. Nandhanar was unique in many ways. The movie has the distinction of being remade four times in Tamil. This version had the great stage artiste, K.B.Sundramabal who was a woman playing the hero. Also, the producer gave her a renumeration of one lakh rupees, unheard of in those days! Comedy was a recipie for box-office success. Soon many movies were released with the comedy track incorporated at the end. They were even released as double-billings, For example - Mahatma Kabirdas - Madayargal Sandhippu and Srimathi Parinayam - Manasamy. Another trend in those days was a gimmick adopted by producers by releasing the same movie under two different names. For example, Srimathi Parinayam was also released under the title Srirama Janma Karanam, Chanda Mohan as Samooga Thondu and Bhama Parinayam under the name Samanthakaman. The directors Rajachandrasekar and Ellis R. Duncan (on the right) were introduced. Ellis Duncan directed S.S.Vasan's Sathi Leelavathi which went on to become a major box-office success of the year. There is an interesting story surrounding the discovery of M.K.Radha who almost did not make it! A popular stage play, Pati Bhakthi was being picturised in 1936. M.K.Radha, who did not act in the original drama was given a contract to appear in the movie. But as luck would have it, the producers of the drama who also controlled the production of the movie stepped in and barred him from acting in the picture. He was very much disheartened. At the same time, S.S.Vasan was toying with a similar story entitled Leelavathi. Just to encourage M.K.Radha and his father Kandasamy, Vasan gave them an opportunity to act in his picture and the picture was a great success. This movie also marked the debut of T.S.Baliah. Sati Leelavathi also had a young man making his screen debut as a Policeman. That young man was none other than M.G.Ramachandran in his first credited role. The rest, as they say, is history. T.P.Rajalakshmi marked her debut as the first lady director in Tamil Cinema with Miss Kamala (shown on the left). Another popular movie of that time was Kuchela. (below) Lyricist Papanasam Sivan acted as Kuchela and S.D.Subbulakshmi acted as Krishna and also as Suseela, wife of Kuchela. Another landmark movie of the year was Pattinattar. It was Produced by Vel pictures. M.M.Dandapani Desikar played the hero. Witnessing the picture, many people took to a life of reclusion. Another film icon, P.U.Chinnappa made his debut in Chanda Kantha, directed by Raja Sandow with the story by J.R.Rangaraju. M.K.T was so popular that the producers tried to cash in on his image by giving the audiences a double dose in Satyaseelan. It had Bhagavatar in a double role as the king as well as the songster in the royal court. N.S.Krishnan and his wife formed a successful on-screen comedy pair with movies like Vasantha Sena directed by Y. V. Rao. Film news anandhan has A-Z collections of cinema. Photographs, information about the films industry and tamil film celebrities. Film news anandhan is called the mobile library of Tamil Cinema. I am proud that my grandfather Film News Anandhan has really achieved something great in his life. 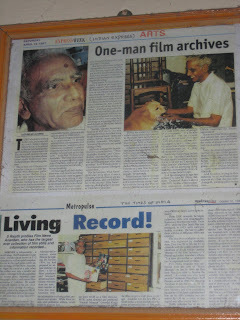 For some of the rare and extinct photographs and prints can be collected from Film news anandhan. The project of archiving all the Cine industry contents in to a web archive is still in progress, so till then you could call him or meet him at this residence. Film news anandhan has opened a stall in the trade fair exhibition.